This is what you'll receive. This is where it fastens in place with the volume and tone potentiometers. Bracket fastened in place on the pickguard with the two potentiometers. How it will look once you route your pickguard with the 0.300" x 0.125" slot. 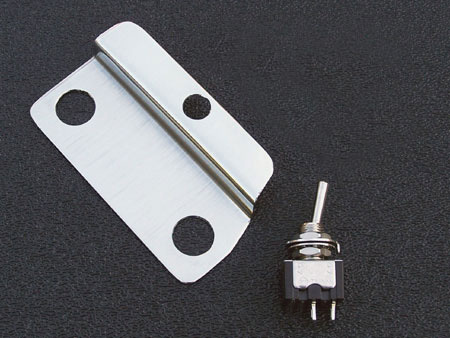 Our custom stainless steel recessed toggle switch mounting bracket allows you to mount the mini-toggle switch used for the neck pickup switching modification in your Strat® style guitar with ease. This bracket is only 0.030" thick which allows it to mount directly under the volume and tone potentiometer with no problems. With this kit you can covertly mount the mini-toggle switch under the pickguard and have only a portion of the toggle lever protrude through the pickguard for a sleek, unobtrusive Black Strat® custom styling. No more chrome hex nuts and flat washers on the top side of your pickguard holding your mini-toggle switch in place, which is bland, uncreative and not unique by any means. This kit keeps the switch out of the way and prevents accidental switching without your knowledge, when this switch is flipped it is intentional, not accidental, you can't bump this one with a knuckle. 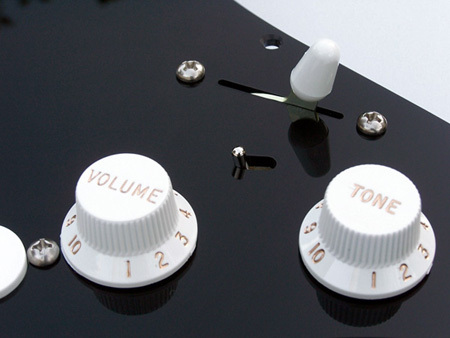 Simply route the recessed mini-toggle switch slot in your favorite pickguard and assemble. The item includes the stainless steel recessed mini-toggle switch mounting bracket, a SPST on/off mini toggle switch along with the Black Strat® wiring diagram and pickguard routing instructions which will be sent to you via email after your order has been invoiced. The mounting holes in which the potentiometers fasten this bracket in place are 3/8" in diameter and fit a standard Fender® Stratocaster® specification pickguard. This kit does NOT include the pickguard, knobs, switch tip, potentiometers, 5-way pickup selector switch or screws as pictured above, they are for reference and illustration purposes only. We also offer other pickguard kits if you are not up to the routing of your own pickguard, they are items #4031, #4031P and #4035. IMPORTANT: This bracket and switch kit is NOT a replacement for any of our Black Strat® pickguard assemblies or pickguard kits which include a pre-routed pickguard, such as #4031P, #4031 or #4035, this bracket and switch are slightly different by design. 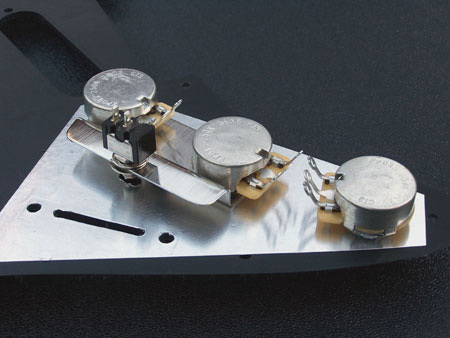 So keep this in mind if you've purchased our #4031P, #4031 or #4035 kits, there are differences between switch types and required slot lengths routed in the pickguard. 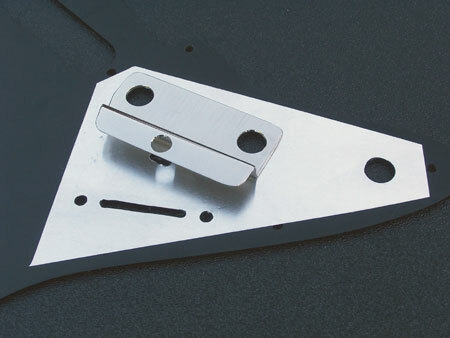 This bracket is sold solely as a stand-alone item where you are required to route the small slot in the pickguard in the correct location and to the dimensions (0.300" x 0.125") according to the specifications of the bracket and SPST on/off switch type. We cannot accept your pickguard to route the mini-toggle switch slot. If you would like more detailed information on how this was installed check out our Black Strat® Project. The components you receive may differ visually from those illustrated above due to various suppliers used for components. Since this is an assembly kit you must have the necessary skills and tools perform the routing of your pickguard and to assemble this kit. You also must possess the knowledge necessary to troubleshoot if problems arise in your assembly or wiring. We do not provide a troubleshooting service to figure out what went wrong with your particular assembly and with any mistakes you might of made. Typical turn-around time from order placement to shipment is up to 21 days. Holiday work-loads sometimes may increase turn-around time, but keep in mind, we don't waste any time in getting these manufactured, packed and shipped on their way to you.